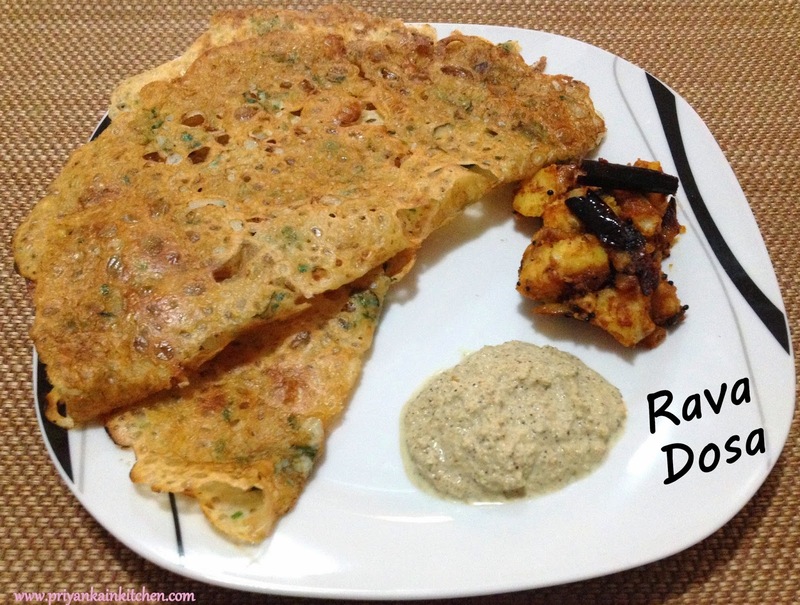 Rava dosa, as the name suggests is a dosa made out of semolina as its main constituent. The best part of this recipe is that its instant and doesn't need any prior planning or preparation. So when ever you are bored of usual food, this is the recipe you can surely try for!!! Mix semolina, rice flour, besan, ginger, coriander and salt in a bowl. Now make a batter adding little water at a time. The final batter should be very thin and without any lumps. Leave it aside for 10 minutes. Now heat a flat and preferably non stick griddle and grease it with little oil. Make sure there are no drops of oil on it. Wipe off all extra oil. Turn the flame to minimum. Now take a ladle full of batter and start pouring it on the skillet from a height of 5-6 inches to form a big circle. Don't pour too much batter at one place. Just keep moving your hand without worrying for any gaps that may be left. Take more batter and fill the gaps. You will notice that as the batter strikes the surface of griddle, it spreads forming small holes. Don't try to fill the holes. Only fill big gaps. Drizzle few drops of oil on top of it. When golden colour starts to appear on the edges, take it off with care. Both the sides will look like as shown in images below. Serve hot with Sambhar, coconut chutney and potato masala.